Save time styling, drying, straightening, and volumizing you hair. The Hair Made frees both your hands so you can be done styling in record time. Achieve that "salon look" every time! 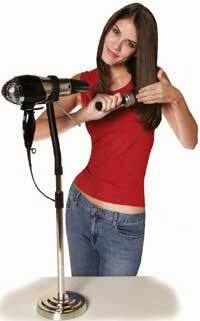 Eliminate the fatigue of holding that heavy hair dryer. The Hair Made is recommended by professional stylists for all hair types. The simple to use Hair Made is designed for the counter top or vanity. The stand is easily height adjustable to accommodate users of any tallness. The flexible gooseneck allows you to bend and focus air at any angle; now drying the back of your head is so easy. Use the Hair Made once and you will be hooked for life! Product includes: Hair Made.